and was going to town but Will Woolf and John Osborne came at noon. And Will went to help them haul their goods from the depot. I cleaned up Winnies room in the afternoon. Wednesday March 5th 1890 Will wroked all day helping Will Woolf get his things moved. They got them all over and a stove and bed put up so they stayed there all night. I was busy about the house work all day. 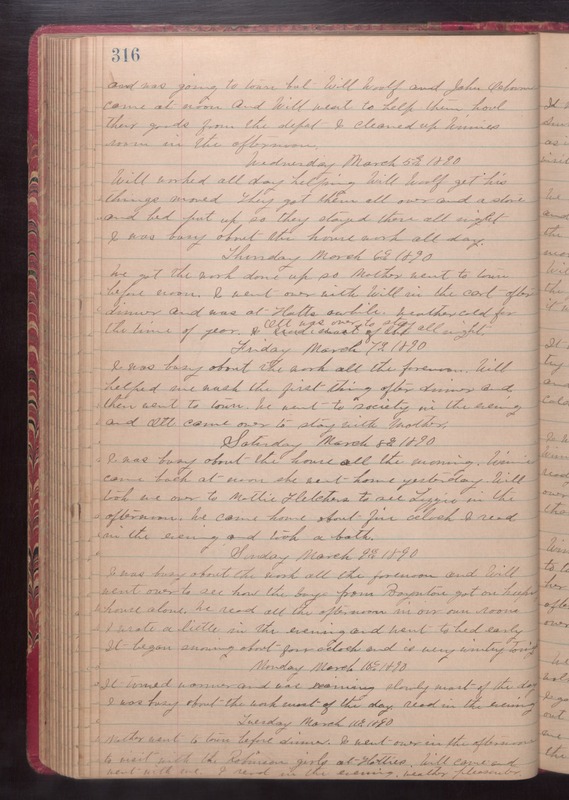 Thursday March 6th 1890 We got the work done up so Mother went to town before noon. I went over with Will in the cart after dinner and was at Hatts awhile. weather cold for the time of year. Ott was over to stay all night. Friday March 7th 1890 I was busy about the work all the forenoon. Will helped me wash the first thing after dinner and then went to town. We went to society in the evening and Ott came over to stay with Mother. Saturday March 8th 1890 I was busy about the house all the morning. Winnie came back at noon she went home yesterday. Will took me over to Mattie Fletchers to see Lizzie in the afternoon. We came home about five oclock. I read in the evening and took a bath. Sunday March 9th 1890 I was busy about the work all the forenoon and Will went over to see how the boys from Boynton got on [keeping?] house alone. We read all the afternoon in our own room. I wrote a little in the evening and went to bed early. It began snowing about four oclock and is very wintry tonight. Monday March 10th 1890 It turned warmer and was raining slowly most of the day. I was busy about the work most of the day. read in the evening. Tuesday March 11th 1890 Mother went to town before dinner. I went over in the afternoon to visit with the Robinson girls at Hatties. Will came and went with me. I read in the evening. weather pleasanter.